As the World Series between the Kansas City Royals and a New York team not from the Bronx is coming to a close, the Yankees are gearing up for this winter’s free agency. When it comes to free agency, fans and analysts alike can point to numerous weak spots on the Yankees roster such as second base, a right handed power bat or a right handed bullpen arm. However, this roster’s most glaring need resides in its starting staff and this free agency class is plentiful of solid arms. While the Yankees and their fans would like to see a Zack Greinke or David Price type arm don the pinstripes, the reality is that they are much too expensive for them, especially when you consider the Yankees current contract obligations. One option that could potentially work for the Bombers is to sign free agent and former Washington National Jordan Zimmermann. Once considered an integral part of the Nats “super-rotation,” Zimmermann has had a solid career in the nation’s capital. He holds a respectable career ERA of 3.32 and has been named an All-Star as recently as 2013 and 2014. 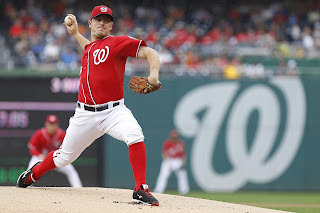 In Washington, Zimmermann held the second spot in the rotation behind ace Max Scherzer but on a team like the Yankees and most others, he would be the team’s number 1 starter. A rotation with a top 3 of Zimmermann, Luis Severino and Masahiro Tanaka would be the best in the A.L. East and challenge to be the best in the A.L. if Tanaka is healthy. Zimmermann does not disappoint when it comes to durability. Over his 7 year career he has averaged 34 starts per season and has pitched to 200 innings over the past 3 years. He is a workhorse arm, something the Yankees current rotation lacks and could surely use. With the combined health concerns of the entire rotation besides Luis Severino, Zimmermann would become an innings eater for the Yanks. Perhaps the biggest reason Brian Cashman should bring out the checkbook for Zimmermann is the fact that he will cost much less than the elite arms on the market. Top tier arms such as David Price and Zack Greinke are expected to fetch north of $170 million but an arm like Zimmermann should cost less than $100 million. Signing the former National that will turn 30 in May to a 5 year deal worth about $90 million would be a smart investment as it would allow them to not break the bank and keep their eyes focused towards the future. In an offseason where the Yanks aren’t expected to do much, cashing in on a pitcher like Zimmermann would benefit the Yankees for the 2016 season and beyond.